Portrait photography is prohibited in the garden. This applies to individuals, groups and professional photographers visiting the garden for the sole purpose of organized photo sessions. 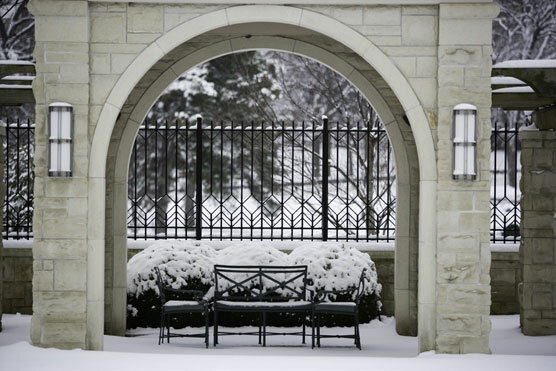 Snapshots of the stunning beauty of the garden are allowed. For Ewing and Muriel Kauffman, the true joy of life grew from their opportunities to share with others. Throughout their lives, they found many ways to enrich the community around them. 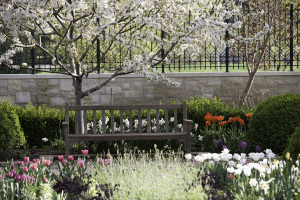 The Ewing and Muriel Kauffman Memorial Garden, an enduring gift for Kansas City, extends the legacy of a gracious couple. The Kauffmans’ world travels inspired the creation of this open space for enjoyment and enrichment, comparable to parks throughout Europe. 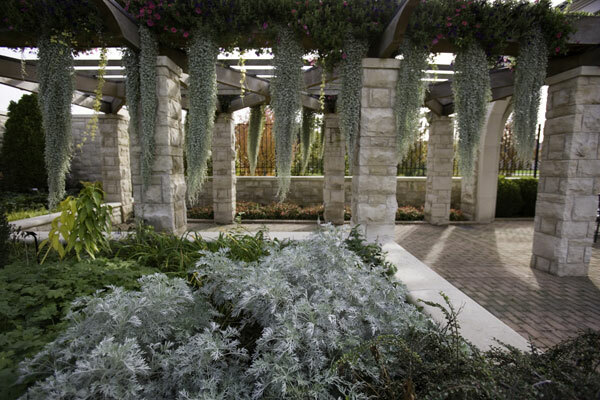 Lush and diverse plant beds feature local and exotic botanicals, including some plant varieties not found elsewhere in the Midwest. 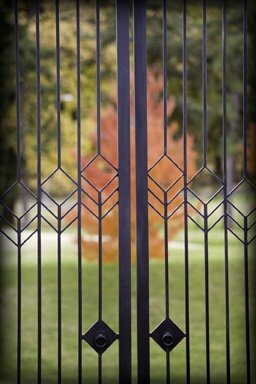 Pruned foliage and flower plantings are framed by stone walls and artfully shaped around playful fountains and elegant pieces by bronze sculptor Tom Corbin. Botany students often visit the nationally-know garden to explore its distinctiveness, but the average visitor is equally entertained. The Orangery is the major architectural feature on the garden lawn, offering a sheltered gathering place for visitors and a site for fragrant and seasonal plants. 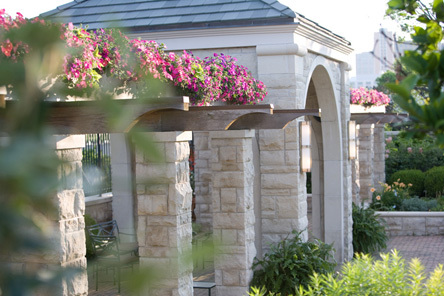 Because the garden is constantly cycling, delightful transitions of foliage and blooms await visitors weekly. 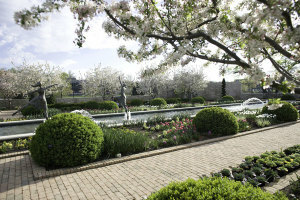 In addition to the perennial beds and many unique trees, shrubs and annual displays are changed at least four times a year. 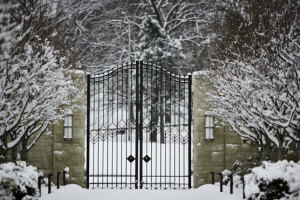 During summer months, visitors can expect to see geraniums, celosia, coleus, marigolds, petunias, vinca and periwinkles. In fall, chrysanthemums, asters, cabbages and kales. In winter, snapdragons, pansies and dianthus, and in spring, tulips, daffodils and hyancith. Mrs. Kauffman’s favorite flowers, gardenias, are featured in the garden at all times and in bloom in late April. 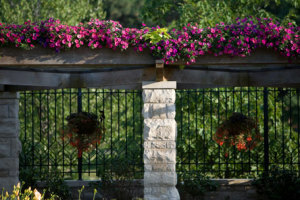 Powell Gardens, in partnership with the Kauffman Foundations, manages and maintains the Ewing and Muriel Kauffman Memorial Garden. 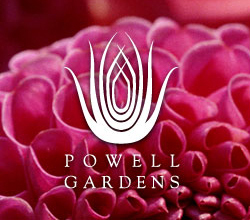 Powell Gardens is a 915-acre not-for-profit botanical garden located 35 miles East of Kansas City.